Top 3 Picks For The Most Fun Digging Toys! 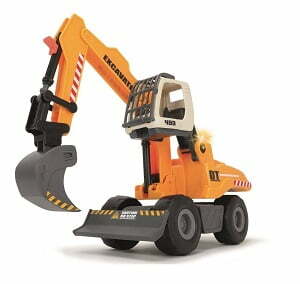 Did you grow up playing with toy excavators and digging toys? It was one of my favorite pastimes, and as a little boy I just dreamed of being able to operate the big heavy machinery one day. 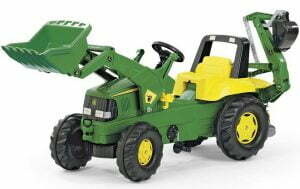 Tractor toys and heavy equipment made me so happy, all I ever wanted to do was play in the sand, make my own trails, and create my own construction job site to see my tractor toys at work! 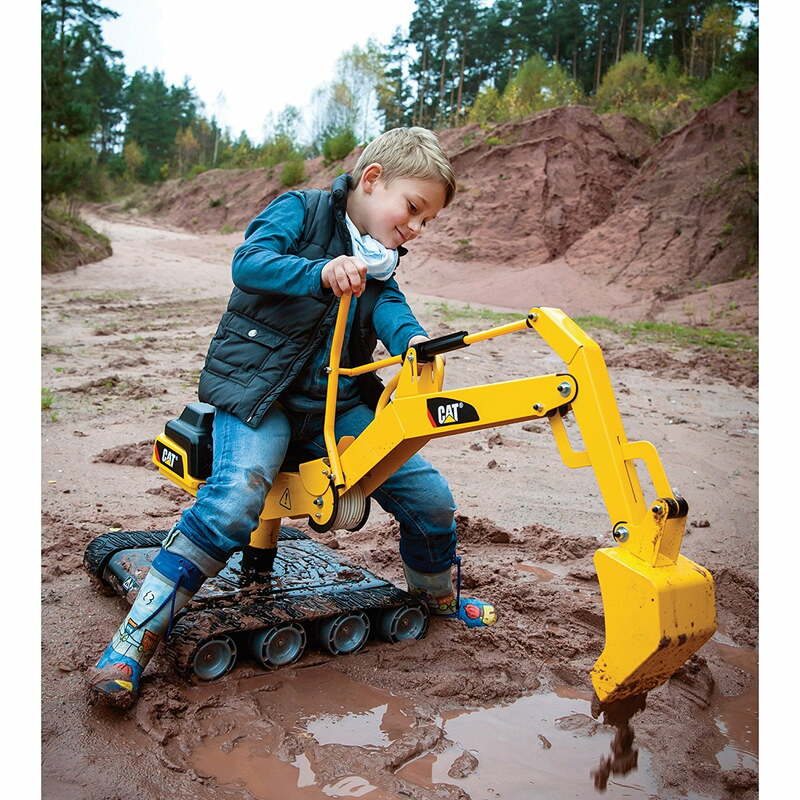 Imagine just being able to create whatever you want whenever you want… That’s what you’re giving your kids the opportunity to do when you buy them digger toys and they love to play in the dirt! 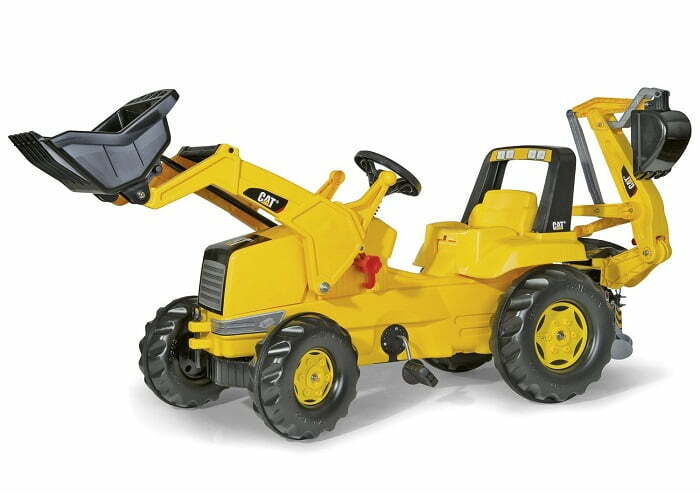 A favorite among all children that play with digging equipment toys, this Bruder Mack tractor trailer can move the backhoe loader or any other scale equipment toys from job site to job site. 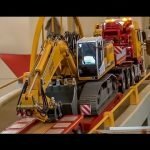 It features removable gates, fold down ramps, and a removable fifth wheel trailer hitch for an ultra realistic construction site experience. In this article, we’ve got tons of great digging toys for kids, both big and small, and even some adults may like! 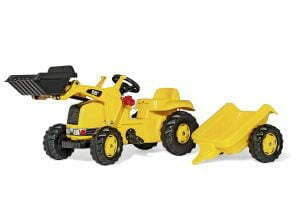 From toy excavators for toddlers, to ride on tractor loaders, and even stationary sandbox diggers and excavators. 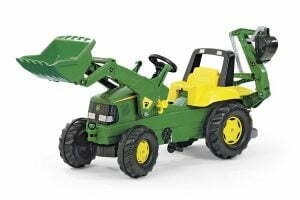 There’s something for every price range, from as cheap as $20 dollars all the way up to $200 – $300 for a fully motorized electric ride on tractor loader… And everything in between for all age groups, including toddlers. 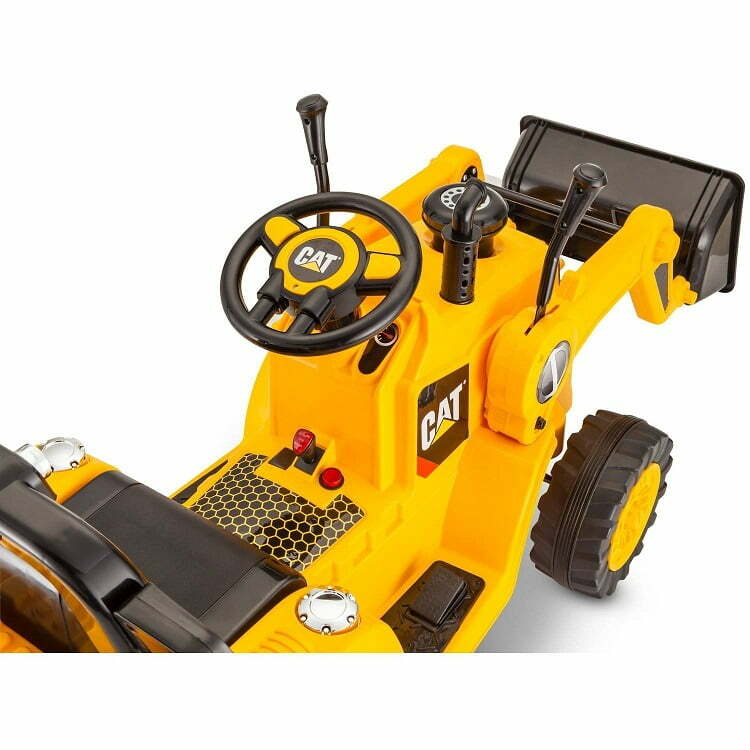 This CAT digger is perfect for digging, dumping and building with gravel, sand and snow. This heavy-duty high-carbon steel frame vehicle allows the operator to swivel the shovel 360° with with mock hydraulic spring-assist dual-action levers that are easy to move safely. This tank’s treads float on 8 wheels for foot-to-ground travel over rough construction sites, while the blow-molded seat provides plenty of comfort for all-day use. 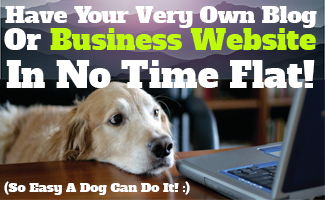 Since this unit requires no charge, it’s always ready to go. This durable equipment withstands rugged use by diligent diggers. Ages 3–6. Weight capacity: 75 lbs. Dimensions: 34.25in.L x 17.7in.W x 37.8in.H. For Peg Perego toys for toddlers, see these childrens riding toys. Sturdy, working dump bucket with tractor ride-on design. 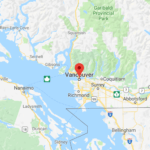 Dimensions: 135″L x 54-1/2″W x 65″H. 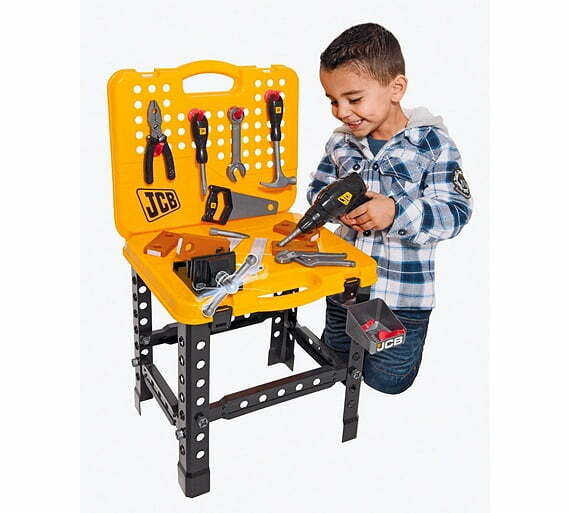 This product helps children live out their construction dreams. 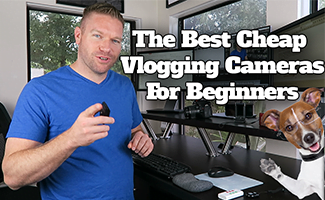 Let the building phase begin with your favorite toddler at the helm. 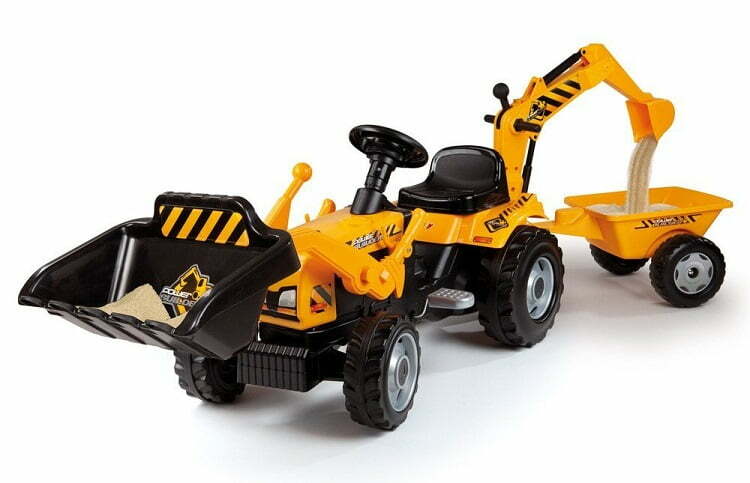 Help develop your child’s imagination with the Bulldozer Ride-On. It’s powered by a rechargeable battery, so kids can spend hours learning to excavate and haul. 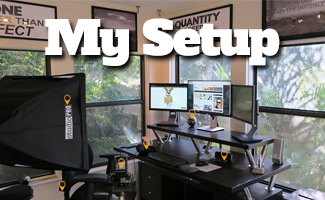 The direct connect charging system makes it easy to get back to work. 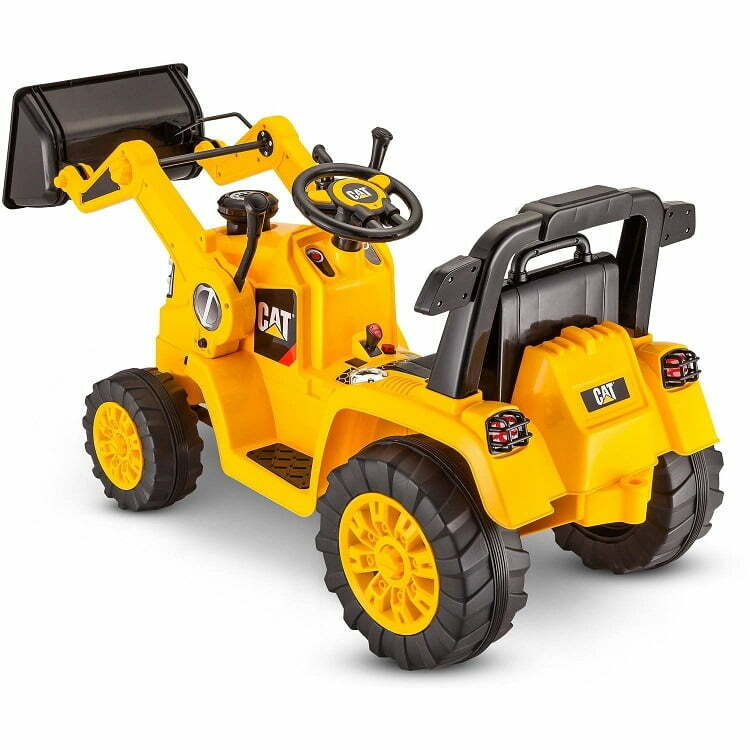 The 6V battery-powered ride-on tractor has a realistic design with a sturdy working dump bucket and rubber traction strip tires, which makes for an exciting experience as children roll across the landscape to pick up a load. The tires are designed to have a good grip on slick surfaces. 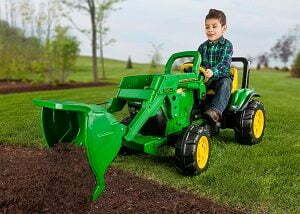 The tractor ride-on has realistic foot pedal acceleration, so little ones will experience a fun ride. However, with a top speed of 2.5 mph, parents can be assured that it will also be a safe ride. 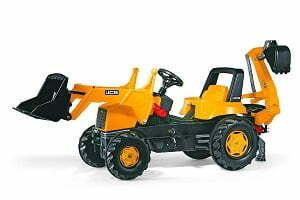 New Holland Backhoe Loader Tractor is a tough pedal tractor with a smooth finish. 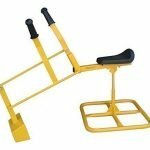 It comes complete with front loader and backhoe that can be raised and lowered, scooped and tipped using the levers. The oversized resin tires have long lasting rubber tread strip. The mechanical features include a strong 12mm thick rear axle, covered integral fixed wheel chain drive, a pedal crank with eccentric bearing chain tensioning system, anti slip pedals and a heavy duty front axle with suspension. 100 lb. weight limit capacity. Put your kids to fun work and play with the JCB rolly Dumper Kid Tractor. Mechanical features include a heavy duty 12mm thick rear axle, covered integral fixed wheel chain drive, a pedal crank with eccentric bearing chain tensioning system and anti slip pedals. The oversized resin tires have a long lasting rubberized tread strip. 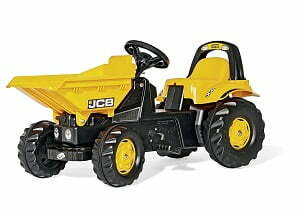 Kids can transport and dump dirt in the Front Dumper. Color Yellow. 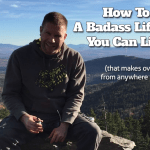 Weight limit 75 lbs. 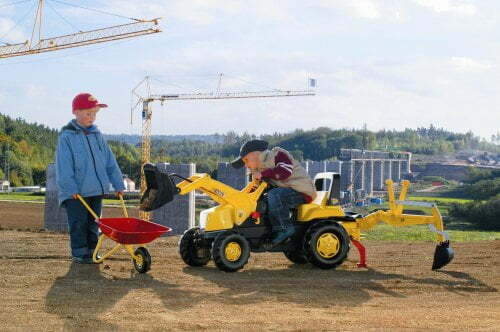 This sandbox digger toy has wheels so your child can move it around like a real backhoe. For fall 2016, the digger has an improved longer base with wider front axle for more stability. The digger features large safety washers on the moving joints. The washers are big enough to keep kids fingers out of the tight area of the joints as they move. Our digger uses heavier metal on the bucket and larger bolts on the joints then similar diggers. When you read feedback on diggers you see that many have trouble with bending buckets and arms, and joints that don’t work smoothly. 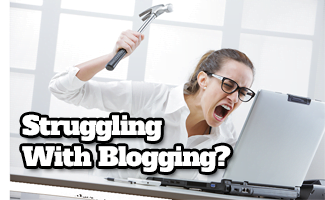 We solve this problem by using heavier gauge metal in the bucket so it won’t bend with regular use. Stiff breaking joints are overcome by using heavier bolts rather then rivets. You can adjust the lock nuts on the joints to tighten or loosen as needed on our digger. Remember to use a good kid safe lubricant on the joints to make them work best. Our digger toy is heavier built then most competing wheeled diggers. Overall weight is 14 pounds. We solve the problem of fading and rust by using a generous amount of powdercoat finish. 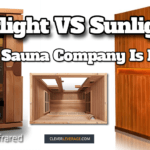 Toy backed by a 30 day satisfaction return guarantee and a one year breakage warranty. If the digger breaks during the first year of use we will send you parts. 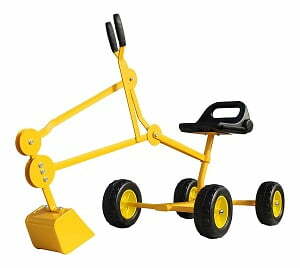 Built for years of use this European styled digger will help kids develop balance and motor skills while having hours of healthy outdoor fun for digging sand, snow, leaves, or dirt. 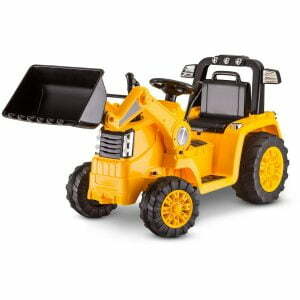 The backhoe and base easily folds down to transport to your favorite outdoor play area. Some people even set up a sandbox in the garage or on the deck or use balls or foams fill to create a play digging area indoors. Seat height is 15 inches. Length with bucket extended 44 inches. Weight limit 120 lbs. This ride on toy comes mostly assembled. You need to put the wheels and the seat on and put the digger on the base. The bucket and joints are pre-assembled. Assembly time is about 10 minutes. For electric powered ride on toys and power wheels, click here. 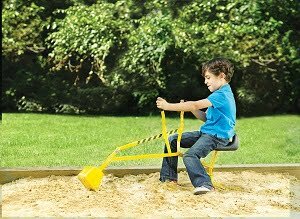 This sandbox digger is commonly sold to schools and playgrounds but is portable and affordable for heavy duty home use. Built to last through time. 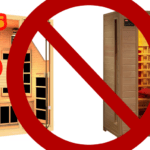 It is rated for age 3 and up but 5 and up will be able to use it better because of its heavy build and dimensions. 5-13 ages.. but you might catch adults on it as well. The digger has bushing on the joints for smoother operation. Our joints are made of bigger material then you see on the cheaper toy excavators where they commonly use weak rivets or small screws instead of our one piece machined arm with large nut. Reeves’ Toys The Big Dig encourages kids to get outside and have more fun in their own backyards! 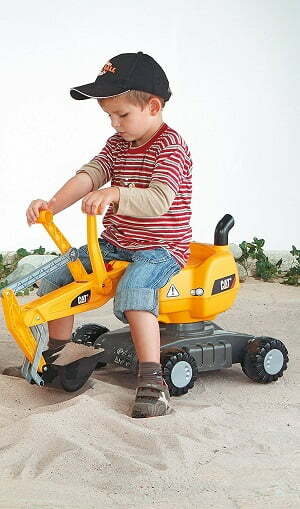 With this sit-on digger, kids can dig in sand, dirt or snow for year-round play! Two-handed controls help kids learn manual dexterity and improve hand-eye coordination. 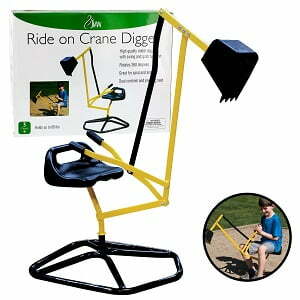 Once seated, grab the easy grip handles to control the swivel digger. The handles move and the seat pivots 360 degrees. 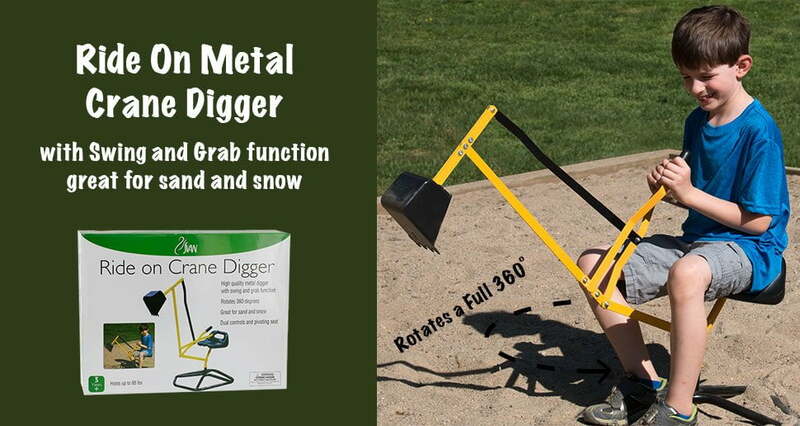 Spin around 360 degrees to dig wherever you like. 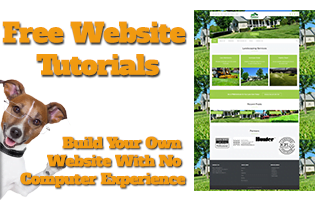 Create your own construction zone! 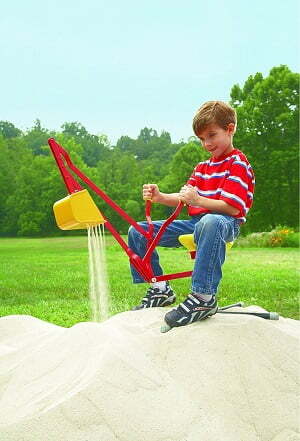 The Wonka Woo Metal Dig & Swivel Sand Digger is the answer to hours of empty summer time. This awesome toy lets kids dig and scoop right from where they sit on its plastic swivel seat. The scooping arm extends a full 38 inches! Constructed of super sturdy metal and plastic, this toy will last season after season, helping kids not only have fun digging in sand, dirt and whatever, but also assists in developing hand/eye coordination. It features an adjustable contoured seat to accommodate kids’ heights, and easy-to-work hand controls for scooping smoothly. 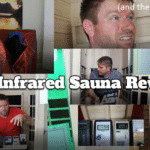 It holds up to 70 pounds and is a quick 10-minute assembly. Time to excavate! About WonkaWoo Creating quality, affordable toys and children’s furniture is what WonkaWoo is all about. From colorful ride-ons to contemporary bookshelves they have something for every child. The people at WonkaWoo believe toys should exercise mind, body, and spirit. They develop toys that focus on enriching both small and large motor skills. Bring the joy of WonkaWoo to your home today. Digger extends 38 inches from seat. 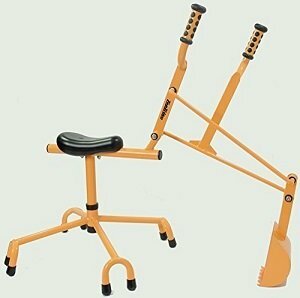 Adjustable contoured plastic seat. 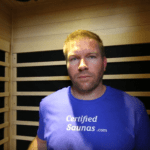 Swivels 180 degrees. Easy-to-work hand controls to work the scoop. 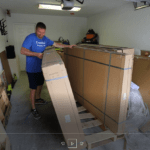 Assembles in minutes. 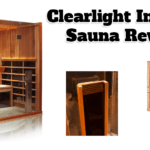 For ages 3 & older or up to 70 lbs.. Dimensions: 51 1/4L x 19 1/2W x 22 1/2H in.. 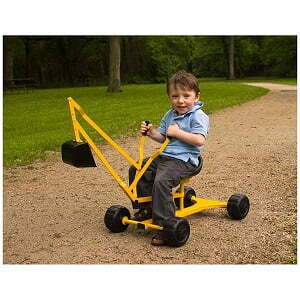 This toy provides your child with the ability to cruise on new adventures and a tool to dig for new treasures. A child can simply sit on the car and walk towards a new location, hence improving their balance and motor skills. The car comes with a horn, so the driver can make their presence known, a siren, to alert pedestrians, and two buttons that play 5 different types of tunes that your child will enjoy. 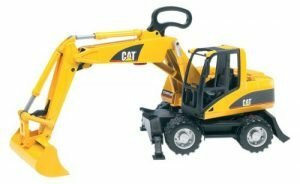 As a child is cruising and listening to music, they can stop at any moment they wish and begin digging for their treasure by using the pulley mechanism within the arm of the ride on Excavator. A child will develop a passion to explore in a fun entertaining way, and any small treasures they find, can be stored within the hidden compartment under the seat. 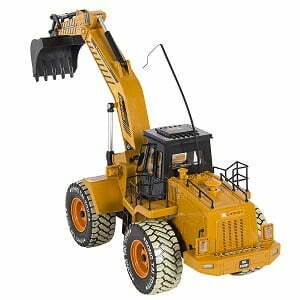 The rolly toys CAT Construction Ride-On: 360-Degree Excavator/Shovel Digger is an exceptional toy excavator that will supply your children with a great many hours of entertainment. 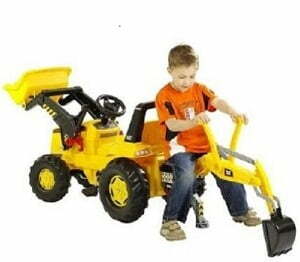 The digger ride-on toy features a scooping shovel and real working dual action levers to allow your children to easily operate the digger while learning valuable coordination skills. 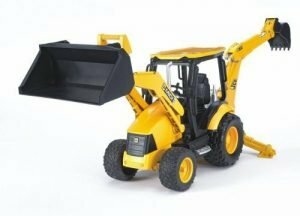 The digger is equipped with a large resin digging shovel that is capable of rotating 360 degrees around the main digger base, enabling your children to scoop in one area and dump the load in another area. 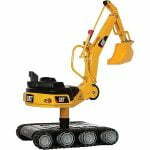 The digger is also equipped with four rolling wheels that allow easy forward and backward movement. The rolling wheels are made of resin with long-lasting rubberized tread strips to ensure better traction. The body of the digger is made up of high-impact blow-molded resin for superb style and long-lasting durability. 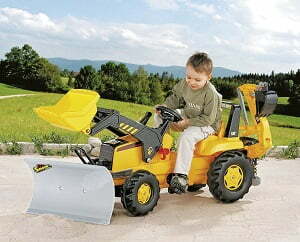 The digger is capable of scooping up sand, loose dirt or gravel and snow. A child will love having this toy because it contains so many interactive functions that a parent is going to wish they were small enough to ride. 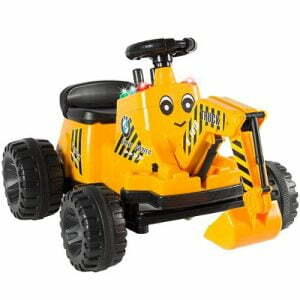 This digger toy comes equipped with a seat belt to ensure you child’s safety as they ride along. 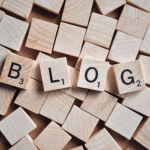 A child can easily move by pressing on the pedal that is on the side and can choose to go forward or in reverse by flipping the switch beneath the steering wheel. As a child is cruising and controlling the direction of the digger with the steering wheel they can let go of the pedal and stop. Then they can start digging using the two levers underneath the steering wheel to move the arm of the digger and begin excavating for thrilling treasures. The ride on car is decorated with plenty of lights making the ride more exciting but above that it contains five different songs that any kid will jam to and enjoy as they are riding on the car. If a parent wishes to have a little more control they can simply flip a switch on the car which disables all functions on the car and enables a parent to control the movement of the car as well as the digger arm through the remote control. 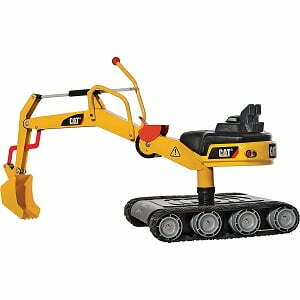 A child will love riding on this digger and enjoy performing digging excavations that will allow them to expand their creativity. 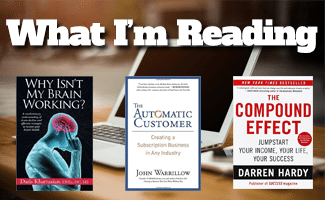 We purchase our products directly from the manufacturers so you know you’re getting the best prices possible. 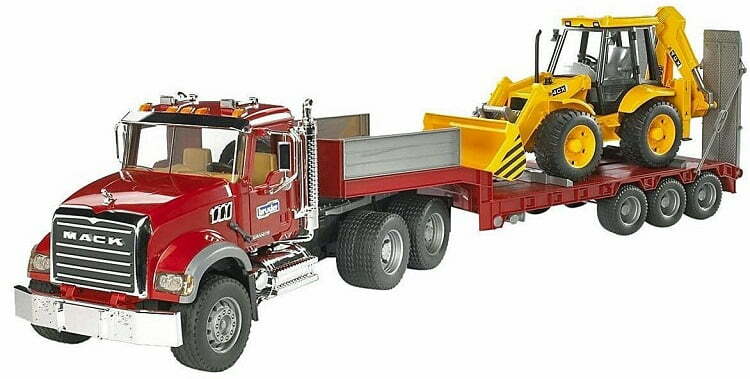 The Builder Max tractor trailer from SMOBY is a very realistic machine with pedals, and with a digger in front. For safety, the tractor is stabilized while in use. The Builder Max steering wheel has a horn. 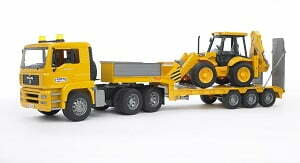 The tractor also has a trailer at the rear that is detachable if you want to use the backhoe by itself. 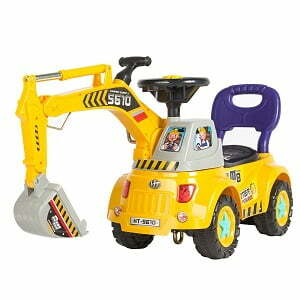 Dickie Toys Construction Mighty Excavator brings the building site into the playroom! 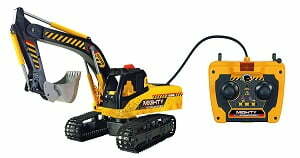 The Mighty Excavator with cable remote control fascinates children with its full driving functions, light and sound effects – just as if it’s come straight from the nearest big building site. The cabin and excavator arm with bucket move just like the full-scale original. The custom mud-splatter effect rounds off the realistic impression. The young builder can rotate the cabin manually so it faces in whichever direction he wants! 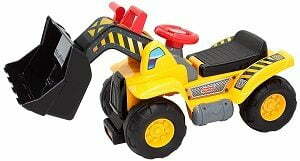 The Dickie Toys Construction Digger: deeper and deeper into the depths! 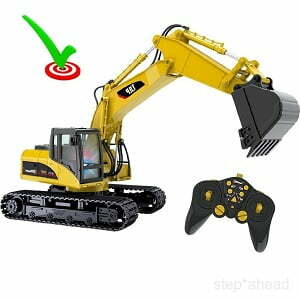 Come to us for automated remote control excavator toys with a wealth of functions. Watch inquisitive children’s eyes light up: a big digger chomps its way gradually into the ground and the builder creates space for a cellar, new houses or big fat pipes. 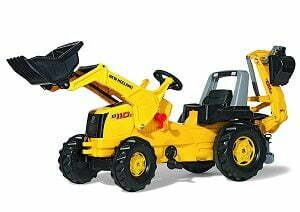 The Dickie Toys Construction Digger allows children to recreate life on a building site on a grand scale. The digger arm and bucket can be raised and lowered at the push of a button – just like real construction vehicles. The young builder can rotate the cabin manually so it faces in whichever direction he wants! Interchangeable attachments, light and sound effects provide a varied play experience. So the kitchen table or living room carpet is transformed into a building site. 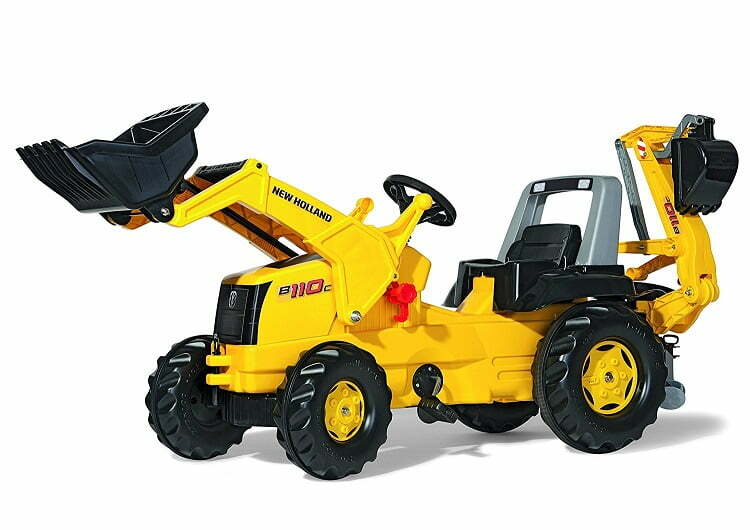 Give imaginative children lots of entertainment with the construction digger or skid steer toy from Dickie Toys. In addition to the tilting, locking and changeable front loader bucket, the backhoe loader is also equipped with a fully functional rear bucket excavator featuring two outriggers to stabilize the vehicle and enable any excavating task. The front loader arm is linked to a one-handed operation mechanism and features a cleverly positioned trigger button,. Thanks to the swiveling driver’s seat and the opening rear window, the available Bruder construction workers can control all the backhoe loader’s functions. Full control of the JCB even after having positioned the construction worker using one of two opening cabin doors thanks to the additional Bruder drag link, fitted through the roof hatch. Four-wheel steering also ensures a tight turning circle. In addition to tread tires, the JCB 5CX eco backhoe loader is also equipped with an off-road front axle to safeguard traction on almost any surface. Simply store the additional drag link in the vehicle underbody once the job is done.